the innermost fetal membrane, which forms a sac filled with amniotic fluid that surrounds the embryo and later the fetus; as it enlarges it gradually obliterates the chorionic cavity and enfolds the umbilical cord. Called also bag of waters. 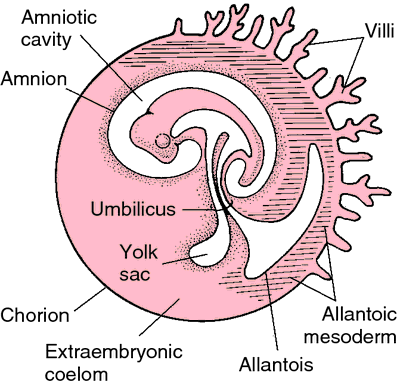 Amnion, chorion, and other embryonic membranes surrounding the embryo of a placental mammal. From Dorland's, 2000.
amnion nodo´sum a nodular condition of the fetal surface of the amnion, usually appearing near the insertion of the cord; it may be associated with multiple congenital abnormalities, especially hypoplastic kidneys and oligohydramnios. nodules in the amnion that consist of typical stratified squamous epithelium. Synonym(s): squamous metaplasia of amnion. the innermost membrane enclosing the developing fetus and which is filled with amniotic fluid; characteristic of reptiles, birds and mammals. See also amniotic. a nodular condition of the fetal surface of the amnion, observed in oligohydramnios associated with absence of the kidneys in the fetus.